GTPL Hathway, the Multi system operator (MSO), will buy additional 13% equity shares in GTPL Space City, a subsidiary company in which the company presently holds 61.50% equity shares. Thus, the company’s shareholding will increase to 74.5%. The company will also acquire remaining 49% stake in GTPL Junagadh making it a wholly owned subsidiary of the company. It owned 51% stake in the company prior to the acquisition. The Behrampur office of multi system operator (MSO) Ortel Communications has been sealed by the district administration for alleged violation of fire safety norms and trade license.As per reports from Odisha TV, the sub-collector and the commissioner of the Berhampur Municipal Corporation (BeMC) raided the office on 26 April. 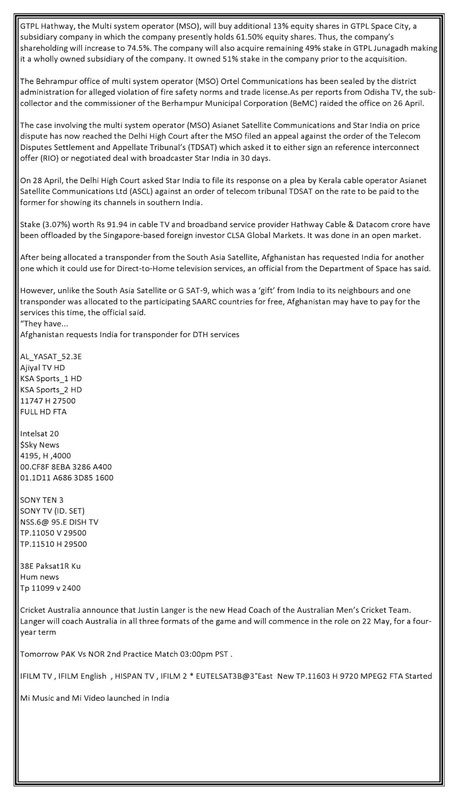 The case involving the multi system operator (MSO) Asianet Satellite Communications and Star India on price dispute has now reached the Delhi High Court after the MSO filed an appeal against the order of the Telecom Disputes Settlement and Appellate Tribunal’s (TDSAT) which asked it to either sign an reference interconnect offer (RIO) or negotiated deal with broadcaster Star India in 30 days. On 28 April, the Delhi High Court asked Star India to file its response on a plea by Kerala cable operator Asianet Satellite Communications Ltd (ASCL) against an order of telecom tribunal TDSAT on the rate to be paid to the former for showing its channels in southern India. Stake (3.07%) worth Rs 91.94 in cable TV and broadband service provider Hathway Cable & Datacom crore have been offloaded by the Singapore-based foreign investor CLSA Global Markets. It was done in an open market. Tomorrow PAK Vs NOR 2nd Practice Match 03:00pm PST .